PM tells Likud faction illegal Bedouin village will be demolished after repeated court rulings against village. 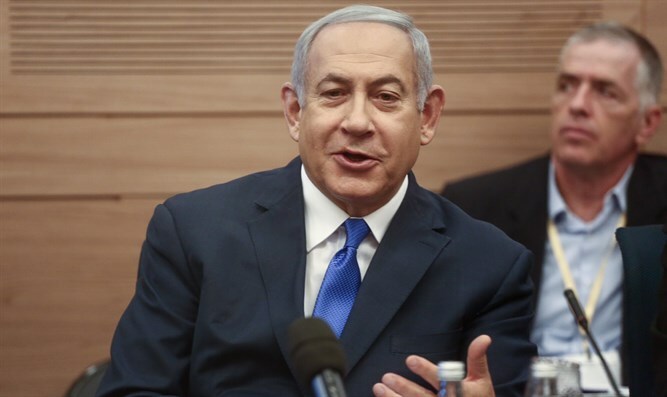 Prime Minister Binyamin Netanyahu responded to Education Minister Naftali Bennett's criticism of the government's seeming inability to demolish the illegal Bedouin outpost of Khan al-Ahmar. "Khan al-Ahmar will be evacuated very soon," Netanyahu declared during the Likud faction meeting Monday, and even said that preparations were being made for the evacuation of the outpost. However, he refused to take an exact date or even hint at when the evacuation would take place. Last month, the prime minister claimed that the postponement of the evacuation of the illegal Bedouin outpost of Khan al-Ahmar would be limited in time. "Khan al-Ahmar will be evacuated. This is a decision of the court, this is our policy, and it will also be implemented. I do not intend to postpone this until further notice, contrary to publications, but for a short period of time." Israeli courts have repeatedly upheld demolition orders issued against the illegal community, culminating in the Supreme Court’s final rejection of the residents’ claims in a ruling in September.